Not every generation is destined to meet along its path such a blessed gift from heaven as was the Grand Duchess Elizabeth Feodorovna for her time, for she was a rare combination of exalted Christian spirit, moral nobility, enlightened mind, gentle heart, and refined taste. She possessed an extremely delicate and multifaceted spiritual composition and her outward appearance reflected the beauty and greatness of her spirit. Upon her brow lay the seal of an inborn, elevated dignity which set her apart from those around her. Under the cover of modesty, she often strove, though in vain, to conceal herself from the gaze of others, but one could not mistake her for another. Wherever she appeared, one would always ask: “Who is she who looketh forth as the morning, clear as the sun” (Song of Solomon 6:10)? Wherever she would go she emanated the pure fragrance of the lily. Perhaps it was for this reason that she loved the color white—it was the reflection of her heart. All of her spiritual qualities were strictly balanced, one against another, never giving an impression of one-sidedness. Femininity was joined in her to a courageous character; her goodness never led to weakness and blind, unconditional trust of people. Even in her finest heartfelt inspirations she exhibited that gift of discernment which has always been so highly esteemed by Christian ascetics. These characteristics were perhaps in part due to her upbringing, which she received under the guidance of her maternal grandmother, Victoria, Queen of England and Empress of India. An unmistakable English stamp was placed on all her tastes and habits and English was closer to her than her native German. The grand duchess herself acknowledged that a great influence on the formation of the inner, purely spiritual side of her character was the example of a paternal ancestor, Elizabeth Turingen of Hungary, who through her daughter Sophia was one of the founders of the House of Hesse. A contemporary of the Crusades, this remarkable woman reflected the spirit of her age. Deep piety was united in her together with self-sacrificing love for her neighbor, but her spouse considered her great beneficence squanderous and at times persecuted her for it. Her early widowhood compelled her to lead a life of wandering and need. Later she was again able to help the poor and suffering and completely dedicate herself to works of charity. The great reverence which this royal struggler enjoyed even during her lifetime moved the Roman Catholic Church in the thirteenth century to number her among its saints. The impressionable soul of the grand duchess was captivated in childhood by the happy memory of her honored ancestor and made a deep impression on her. Her rich natural gifts were refined by an extensive and wide education which not only satisfied her mental and esthetic needs but also enriched her with knowledge of a purely practical nature, essential for every woman with household duties. “Together with Her Majesty (i.e., Empress Alexandra Feodorovna, her younger sister) we were instructed during our childhood in everything,” she once said in answer to how she became acquainted with all the details of housekeeping. Of her experiences in the Roman Catholic world, the grand duchess sometimes recalled a trip to Rome which she had taken together with the late grand duke soon after the jubilee of Pope Leo the XIII. The latter knew well the unshakable firmness of Sergei Alexandrovich’s Orthodox convictions and regarded him highly, having first made his acquaintance when the grand duke, still a child, was visiting Rome. This long-standing acquaintance allowed them to converse informally. Between them there even arose an argument about how many popes were named Sergius. Neither of these exalted disputants wanted to give way to the other and the pope had to withdraw into his library to check. He returned a bit upset. The grand duchess, of her own volition decided to unite herself to the Orthodox Church. When she made the announcement to her spouse, according to the account of one of the servants, tears involuntarily poured from his eyes. The Emperor Alexander III himself was deeply touched by her decision. Her husband blessed her after Holy Chrismation with a precious icon of the Savior, “Not Made by Hands” (a copy of the miraculous icon in the Chapel of the Savior), which she treasured greatly throughout the remaining course of her life. Having been joined to the Faith in this manner, and thereby to all that makes up the soul of a Russian, the grand duchess could now with every right say to her spouse in the words of the Moabite Ruth, “Your people have become my people, and your God my God” (Ruth 1:16). The grand duke’s extended tenure of office as Governor-General of Moscow, the true heart of Russia, where he and his wife were in living contact with the ancient, holy shrines and the immemorial Russian national way of life, must have bound the grand duchess even more to her new homeland. However, not everyone was capable of understanding the change which had taken place in her. One had to live through such a staggering catastrophe as this, in order to be convinced of the frailty and illusory nature of wealth, glory and the things of this world, and about which for so many centuries we have been warned by the Gospel. For the society of that time, the decision of the grand duchess to dismiss her court in order to leave the world and dedicate herself to serving God and neighbor, seemed as scandal and madness. Despising both the tears of friends, gossip and mockings of the world, she courageously set out on her new path. Having earlier chosen for herself the path of the perfect, i.e. the path of ascetic struggle, she began with wisely measured steps to ascend the ladder of Christian virtues. The advice of wise instructors was not foreign to her, guiding those starting out on the path of Christian activity to learn from others the way of life so as “not to teach oneself, not to go without a guide along a path which one had never traveled and hence quickly lose one’s way; not to travel more or less correctly, nor become exhausted from too swift a run or to fall asleep while resting” (Jerome, A Letter to the Monk Rusticus). Therefore she strove to understand nothing without the direction of spiritually experienced elders, especially the elders of the Zosima Hermitage under whom she placed herself in total obedience. As her heavenly guides and protectors she chose St. Sergius and St. Alexis of Moscow. She was entrusted to their special protection by her late spouse whose remains she buried at the Chudov Monastery in a magnificent tomb, styled after those in the ancient Roman catacombs. The extended period of mourning for the grand duke, during which she retired into her interior world and was continually in church, was the first real break to separate her from what up until then had been her normal everyday life. The move from the palace to the building she acquired at Ordinka, where she allotted only two very modest rooms for herself, signaled a full break with the past and the beginning of a new period in her life. From now on her main task became the building of a sisterhood in which inner service to God would be integrated with active service to one’s neighbor in the name of Christ. This was a completely new form of organized charitable Church activity, and consequently drew general attention to itself. At its foundation was placed a deep and immutable idea: no one could give to another more than he himself already possessed. We all draw upon God and therefore only in Him can we love our neighbor. Natural love so-called or humanism quickly evaporates, replaced by coldness and disappointment, but one who lives in Christ can rise to the heights of complete self-denial and lay down his life for his friends. 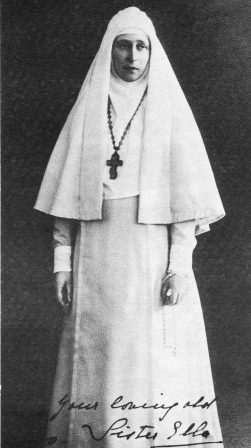 The grand duchess not only wanted to impart to charitable activities the spirit of the Gospel but to place them under the protection of the Church. Thus she hoped to attract gradually to the Church, those levels of Russian society, which up until that time had remained largely indifferent to the Faith. Highly significant was the very name the grand duchess bestowed upon the institution she established—the Martha and Mary Convent, which name contains within itself the mission, the life of its holy patrons. The community was intended to be like the home of Lazarus which the Savior so often visited. The sisters of the convent were called to unite both the high lot of Mary, attending to the eternal word of life, and the service of Martha, to that degree in which they found Christ in the person of His less fortunate brethren. In justifying and explaining her thought, the ever-memorable foundress of the convent said that Christ the Savior could not judge Martha for showing Him hospitality, since the latter was sign of her love for Him. He only cautioned Martha, and in her all women in general, against that excessive fussing and triviality which draw them away from the higher needs of the spirit. To be not of this world, and at the same time live and act in the world in order to transform it—this was the foundation upon which she desired to establish her convent. 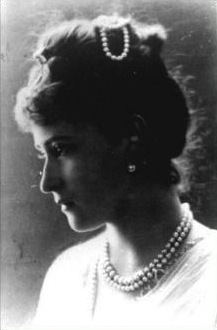 Striving to be an obedient daughter of the Orthodox Church in all things the grand duchess did not desire to make use of the advantages of her position fearing lest even in the smallest way she take liberties and depart from obedience, from the rules or specific statutes established for everyone by the Church Authority. On the contrary, she fulfilled with complete readiness the slightest desire of the latter even if it did not coincide with her personal views. At one time, for example, she seriously thought about reviving the ancient institution of deaconess, in which she was zealously supported by Metroplitan Vladimir of Moscow. Bishop Germogen (at this time of Saratov, later of Tobolsk where he was martyred), because of a misunderstanding, stood up against this idea, accusing the grand duchess without any foundation, of Protestant tendencies (of which he later repented), and counseled her to abandon her cherished dream. Having been misunderstood in the best of her strivings, the grand duchess did not stifle her spirit because of this trying disappointment, but rather put her whole heart into her beloved Martha and Mary Convent. It is not surprising that the convent quickly blossomed and attracted many sisters from the aristocracy as well as the common people. Nearly monastic order reigned within the inner life of the community and both within and without the convent her activities consisted in the care of those who visited the sick who were lodged in the convent, in the material and moral help given to the poor, and in the almshouse for those orphans and abandoned children found in every large city. The grand duchess paid special attention to the unfortunate children who bore within themselves the curse of their fathers’ sins, the children born in the turbid slums of Moscow only to wither before they had a chance to blossom. Many of them were taken into the orphanage built for them where they were quickly revived spiritually and physically. For others, constant supervision at their place of residence was established. The spirit of initiative and moral sensitivity which accompanied the grand duchess in all her activities, inspired and impelled her to search out new paths and forms of philanthropic activity, which sometimes reflected the influence of her first, western homeland, and its advanced organizations for social improvement and mutual aid. And so she created a cooperative of messenger boys with a well built dormitory, and apartments for the girls who took part in this activity. Not all of these establishments were directly connected with the convent, but they were all like rays of light from the sun united in the person of their abbess, who embraced them with her care and protection. Having chosen as her mission not only to serve one’s neighbor in general, but also the spiritual re-education of contemporary Russian society, the grand duchess wanted to speak to the latter in a closer, more understandable language about Church art and Orthodox liturgical beauty. All the churches founded by her, especially the main church of the convent, built in the Novgorod-Pskov style by the famous architect Shchusev and painted by Nesterov, were distinguished by their austere style and the artistic unity of the interior and exterior ornamentation. The crypt located under the arches of the convent church also evoked general admiration for its peaceful warmth. The church services in the convent were always outstandingly well performed, thanks to the exceptionally capable spiritual father chosen by the abbess. From time to time she attracted other fine pastoral strength from Moscow and all parts of Russia to serve and preach. Like bees gathering nectar from all flowers, according to the words of Gogol, for her, as a true Christian, there was no ultimate course of study and she remained a conscientious humble student all her life. All the external decor of the Martha and Mary Convent as well the internal structure, and in general all the material creations of the grand duchess were stamped with elegance and culture. This was not because she conveyed to it some sort of self-satisfying significance, but because this was the spontaneous action of her creative spirit. Having concentrated her activity around the convent, the grand duchess did not sever her ties with those other social organizations and institutions of a charitable or spiritually enlightening nature with which she had been bound by close moral ties ever since her first years in Moscow. Among these, the Palestine Society occupied the first place, so close to her because it called to life the deep Russian Orthodox feeling of her spouse, Grand Duke Sergei Alexandrovich, for the Holy Land. Having inherited from him the chairmanship of this society, she imitated him in holy zeal for Sion and in tireless concern over Russian pilgrims heading for the Holy Land. Her cherished dream was to go with them, though she already had earlier visited the holy places together with the late grand duke. The unbroken chain of activity and responsibilities, becoming more complicated with every year, prevented her for a long time from leaving Russia for the Holy City. Alas! No one then foresaw that she would arrive in Jerusalem only after her repose, in order to find there a place for eternal rest. Her mind was always in harmony with her heart, and in the Palestine work she exhibited not only love and zeal for the Holy Land but a great working knowledge, as if she directly controlled all the institutions of the Society. During the last years before the war she was occupied with plans for the construction of a metochion to St. Nicholas, in Bari, with a church worthy of the Russian name. The project and model of the building, executed by Shchusev in the ancient Russian style, was permanently exhibited in her reception room. Countless papers and callers, the examination of various types of petitions and entreaties which were presented to her from all parts of Russia, as well as other affairs, usually filled her whole day and frequently brought her to the point of total exhaustion. This did not hamper her from spending the night at the bedside of suffering patients or from attending services in the Kremlin and at the greatly loved churches and monasteries in all parts of Moscow. The spirit strengthened the weakened body (her only rest was pilgrimages to various parts of Russia for prayer. However, even here the people took away the possibility of her finding seclusion and quiet. Greatly honoring her royal birth and great piety, the people ecstatically met her everywhere. The trips of the grand duchess to various cities of Russia, against her will turned into triumphant marches). Concealing her struggles, she always appeared before people with a bright, smiling face. Only when she was alone or with a few close people, her face and especially her eyes reflected hidden sorrow—the mark of a great soul languishing in this world. Having detached herself from almost all earthly things, she even more brightly radiated an inner light, especially by her love and tenderness. No one could do an act of kindness more delicately—to each according to his need or spiritual temperament. She was not only capable of weeping with the sorrowful but of rejoicing with those who rejoice, which is usually the more difficult. Though not a nun in the strict sense, better than any nun she observed the great law of St. Nilus of Sinai: “Blessed is the monk who honors every man as (a) god after God.” Find the best in every man and, “Have mercy on the fallen,” was the continual striving of her heart. A meek spirit did not prevent her from blazing with holy wrath before injustice. Even more strictly she judged herself if she made some mistake, however involuntarily. Allow me to present a fact which witnesses to this facet of her character, as well as how her sincerity won out against an inborn reserve and the demands of social etiquette. Once during the time I was vicar bishop of Moscow she offered me the chairmanship of a purely secular organization, not having any activities connected with the Church. I was involuntarily embarrassed, not knowing how to answer her. Understanding my position, she immediately said decisively, “Forgive me, I made a foolish suggestion,” and thus led me out of a difficult situation. The high position of the grand duchess along with her openness attracted many and various organizations and individual petitioners to her for her help, protection, or authoritative influence in the higher echelons of both local Moscovite and the central authority. She carefully replied to all petitions except for those which bore political overtones. The latter she decisively rejected, considering dealings with politics to be incompatible with her new calling. She paid special attention to all institutions of Church, charitable or artistic and scientific character. She also zealously worked to preserve the more important daily customs and traditions which made life so rich in old, beloved Moscow. The anniversary holiday of 1912 gave her an unexpected chance to exhibit her zeal in this direction. Here are the circumstances of this activity, hitherto known only to a few people, including even those who had direct connection with this work. During the elaboration of the program for the celebration of the hundredth anniversary of the War for the Homeland, there arose in the special committee organized in Moscow a heated debate over how to celebrate the Thirtieth of August, the final day of the anniversary festival in Moscow, where the emperor, according to ceremony was supposed to arrive from Borodino. The representative of the ministry of the court offered to place at the center of the festival day a visit by the emperor to the Zemsky Kustarny Museum, which had absolutely nothing to do with the historical recollection of 1812. Within a week, she informed me that the emperor had changed the program according to our desires. When the Thirtieth of August arrived it presented a magnificent picture of a genuinely national, Church and patriotic festivity which will never be forgotten by the participants. For this fete Moscow was indebted to the intercessions of the grand duchess who exhibited in the present circumstance not only her devotion to the Church but a deeply historical, purely Russian devotion. At the beginning of the war she gave herself over with complete self-sacrifice to the service of the sick and wounded soldiers whom she visited not only in the hospitals and sanitoriums of Moscow but also at the front. Like the empress, she was not spared the slander which accused them of excessive sympathy for wounded Germans, and the grand duchess bore this unwarranted, bitter offense with her usual magnanimity. When the revolutionary storm broke out she met it with amazing self-control and calm. It seemed that she stood on a high, unshakable cliff, and from there fearlessly looked out at the waves storming around her and raised her spiritual vision to eternity. The charm of her whole temperament was so great that it automatically attracted even the revolutionaries when they first arrived to examine the Martha and Mary Convent. One of them, apparently a student, even praised the life of the sisters, saying that no luxuries were noticeable, and that cleanliness and good order were the rule, which was in no way blameworthy. Seeing his sincerity, the grand duchess struck up a conversation with him about the outstanding qualities of socialist and Christian ideals. “Who knows,” remarked her unknown conversationalist as if influenced by her arguments, “perhaps we are headed for the same goal, only by different paths,” and with these words left the convent. “Obviously we are still unworthy of a martyr’s crown,” the abbess replied to the sisters’ congratulating her for such a successful end to the first encounter with the Bolsheviks. But that crown was not far from her. During the course of the last months of 1917 and the beginning of 1918, the Soviet power to everyone’s amazement granted the Martha and Mary Convent and its abbess complete freedom to live as they wished and even supported them by supplying essentials. This made the blow even heavier and unexpected for them when on Pascha the grand duchess was suddenly arrested and transported to Ekaterinburg. His Holiness Patriarch Tikhon attempted with the help of Church organizations to take a part in her liberation, but was unsuccessful. Her exile was at first accompanied by some comforts. She was quartered in a convent where all the sisters were sincerely involved. A special comfort for her was that she was not hampered from attending services. Her position became more difficult after her transfer to Alapaevsk where she was imprisoned in one of the city schools together with her ever-faithful companion, Sister Barbara, and several grand dukes who shared her fate. Nevertheless she did not lose her abiding firmness of spirit and occasionally would send words of encouragement and comfort to the sisters of her convent who were deeply grieving over her. And so it continued until the fateful night of 5/18 July. On this night together with the other royal captives striving with her and her valiant fellow-struggler Barbara in Alapaevsk, she was suddenly taken in an automobile outside the city and apparently buried alive with them in one of the local mine shafts. The results of later excavation there has shown that she strived until the last moment to serve the grand dukes who were severely injured by the fall. Some local peasants who carried out the sentence on these people whom they did not know, reported that for a long time there was heard a mysterious singing from below the earth. As though in reward for her earthly struggles and special love for the Holy Land, her martyred remains, which according to eyewitnesses were found in the mine shaft completely untouched by corruption, were destined to rest at the same place where the Savior suffered and rose from the dead. Exhumed on the orders of Admiral Kolchak, together with the bodies of other members of the royal house killed at the same time (the Grand Duke Sergei Michailovich, the Princes John, Igor, and Konstantine Konstantinovich, and the son of the Grand Duke Paul Alexandrovich, Prince Paley), their remains and the bodies of the grand duchess and Sister Barbara were taken first to Irkutsk and then to Peking where they remained for a long time m the cemetery church of the Russian Ecclesiastical Mission. From there, through the concern of her sister, Princess Victoria, the Marchioness of Milford-Haven, to whom she was closely bound during life, her coffin and Sister Barbara’s were transferred from Shanghai and sent to Palestine. On the 15th of January, 1920, the bodies of both sufferers were triumphantly met in Jerusalem by the English authorities, the Greek and Russian clergy, as well as crowds of the large Russian colony and local inhabitants. Their burial took place the next day and was served by the head of the Church of Jerusalem, the Blessed Patriarch Damianos, together with a host of clergy. As if destined for the purpose, the crypt below the lower vault of the Russian church of St. Mary Magdalene was adapted as a sepulchre for the grand duchess. This church, built in memory of the Empress Maria Alexandrovna by her august children, was not strange to the deceased, for together with the Grand Duke Sergei Alexandrovich she had been present at its consecration in 1888. Located on a picturesque slope of the Mount of Olives, it is the best-styled and most graceful of all the churches one finds in Palestine, attracting one’s gaze even from a distance by its colorful and purely Russian lines. The martyr herself could not have chosen a better resting place even if, having foreseen that she would have to repose for a time outside her convent, she had earlier prepared a grave for herself. Here, everything reflects her spirit: the golden domes of the church, sparkling in the sun amidst green olive trees and cypresses; the artistic interior furnishings, stamped with the inspiration of Vereshchagin, and the very character of the holy images, pierced through by the rays of Christ s Resurrection. Even closer and dearer to her heart is the fragrance of the holy places, which breathes upon her sepulchre from all sides. Below, beneath the tomb stretches out a unique view of the Holy City with the great cupola of the Life-Giving Tomb rising on high; at the foot of her tomb, the Garden of Gethsemane where in agony the Divine Sufferer prayed until drops of blood appeared. Further on, Gethsemane itself, the place of the Mother of God’s burial and to the left one can discern half-concealed by the folds of mountains, Bethany, that true Convent of Martha and Mary, the sister of Lazarus, whom the Lord called forth from the grave; and above, the Church of St. Mary Magdalene joyously crowns Mt. Olivet, whence the risen Savior rose gloriously to heaven in order to crown from there all those who amid temptations remained faithful to Him until death (see Rev. 111:5, 21).